It's been awhile since I've shared what I've been baking lately and it's not for lack of trying out different recipes. 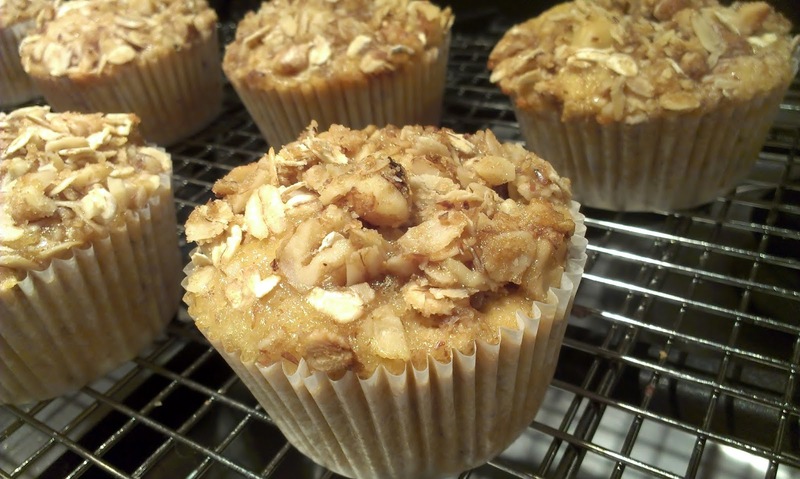 I've been falling back on all the usual suspects, but I did discover my new favorite banana bread recipe this summer, as well as these amazing Hummingbird Muffins. I found this recipe in the April issue of Runner's World and they are a huge hit with my family. I add whole wheat flour, substitute milk (or you could use kefir or buttermilk) in lieu of oil, ground flaxseed if you don't have protein powder and walnuts instead of pecans. Enjoy! Preheat oven to 350F. In a mixing bowl beat sugar and honey with eggs. Whisk in milk, applesauce, and vanilla. Gradually mix in flour and whisk until the mixture is smooth. Add salt, baking powder, and cinnamon. Whisk everything well and add walnuts, pineapple, and bananas. Whisk until combined. Prepare 15-18 muffin tins. Fill each about 3/4 full - almost up to the top. Combine all crumble ingredients. Sprinkle each muffin with the crumble mixture. Bake for 20-30 minutes or until a toothpick comes out clean. I made those and they were sooo delicious!! I meant to add wheat flour, but I forgot until the muffins were in the oven.